Cotton fabric, wool/polyester batting, fabric paint, cotton thread. 39" x 39"
Lepidoptera is the order of insects that includes butterflies and moths. Can you tell that it started with this photo I took in my garden a few years ago? 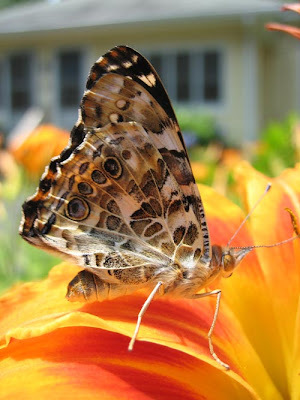 This is a Painted Lady butterfly. It has wonderful patterns on its wings, but it is not very brightly colored. I used the patterns and completely changed the colors. 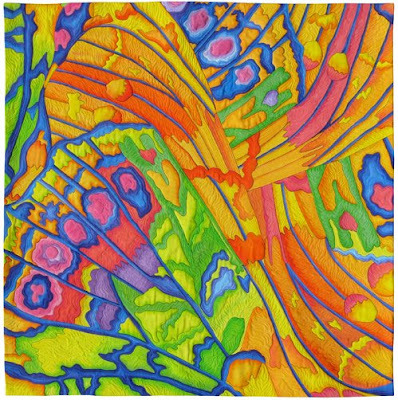 My quilt is a bit psychedelic in comparison to the butterfly! Besides being the first wholecloth painted quilt I’ve ever done, it is the first quilt I faced, rather than bound, and the first quilt I made using batting made of wool and polyester (recommended by my friend Nancy G. Cook, who uses it in all her work). I liked it a lot. 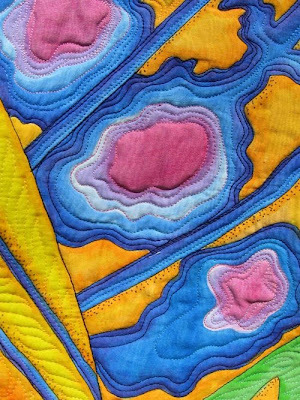 “Lepidoptera” is also the first piece I have quilted with Aurifil threads, and I loved working with them. Aurifil noticed I was using their thread, and asked if they could display “Lepidoptera” in their booth at Quilt Market next week. I was thrilled. If you are going, check it out there! Set up for quilting: I use an open-toe embroidery foot. Before quilting, I double check for good thread balance in top and bobbing on a sample quilt sandwich. The open foot allows me complete visibility of where the needle will go. I get a better stitch when the feed dogs are engaged. It can be tedious but I prefer the stitch quality. Basting Threads: I remove the basting stitches as I get to them. If I run over them, they can be more difficult to remove. A pair of pointed tweezers helps remove any embedded threads. Thread Painting: After outlining the design to stabilize the sandwich, I then do the thread painting of the designs using my hands to stretch the sandwich flat as it goes under the needle. This is the stage where the details of the design really come to life. Importance of Specimens: One of the little cones turned sideways was confusing, the specimen helped clarify lines. Check out the size comparison of the specimen to my design. Echo Quilting: Once the outlining and the thread painting are completed, I begin the echo quilting. The echo quilting on Hawaiian quilts has always fascinated me, so I riff off them with machine quilting to emphasize the negative spaces (the spaces around the designs) on my quilts. I love the rhythm and texture that builds up. Chocolate: The first round of quilting is the most difficult and time consuming as that is when many of the details are filled which requires lots of turning of the sandwich and short lines of stitching. I line up the next round of quilting with the presser foot so that the previous line just shows inside the foot. After about 3-4 rounds, the quilting gets easier with smoother curved quilting lines and begins to go faster. The first several quilting rounds are tedious and a piece of chocolate helps me gather strength for the next round. I finish the quilting by going back into the small isolated areas of background and quilt them. Again, chocolate comes to the rescue. The quilt seems totally different when the quilting is done. This is why I quilt rather than paint. Blogger Jill asked why I use heavy weight fabric on the back. Jill, it reduces the likelihood that I will have any tucks in the backing fabric. Good question. 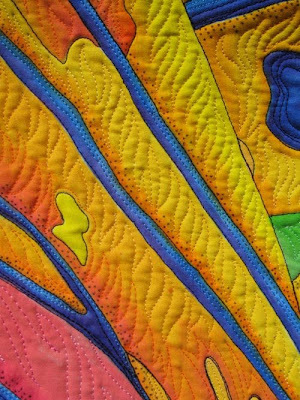 Blogger Valerie – hope this answered some questions about quilting. We really appreciate hearing from those following our blog.